Altank's Reviews: Chapter VI, The Leopard 2A4. 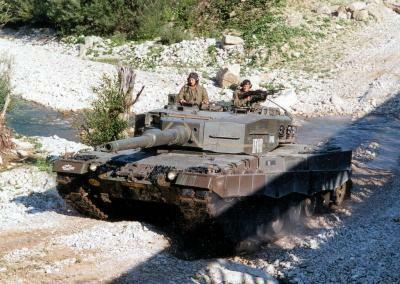 The Leopard 2 is a main battle tank developed by Krauss-Maffei in the early 1970s for the West German Army. 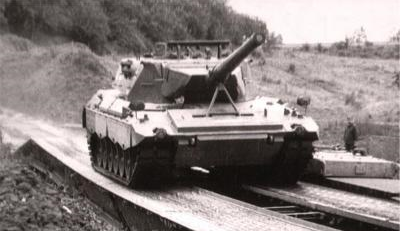 It's worth mentioning that even as the Leopard 1 was entering service in 1965, an up-gunned version provided with the new Rheinmetall L44 120mm gun was being considered to keep pace with newer Soviet designs; however this project was cancelled in favour of the MBT 70 project developed jointly with the United States. Only after Germany withdrew from the project in 1969, following large cost overruns, work on a national development was started, with seventeen prototypes ordered in 1971. 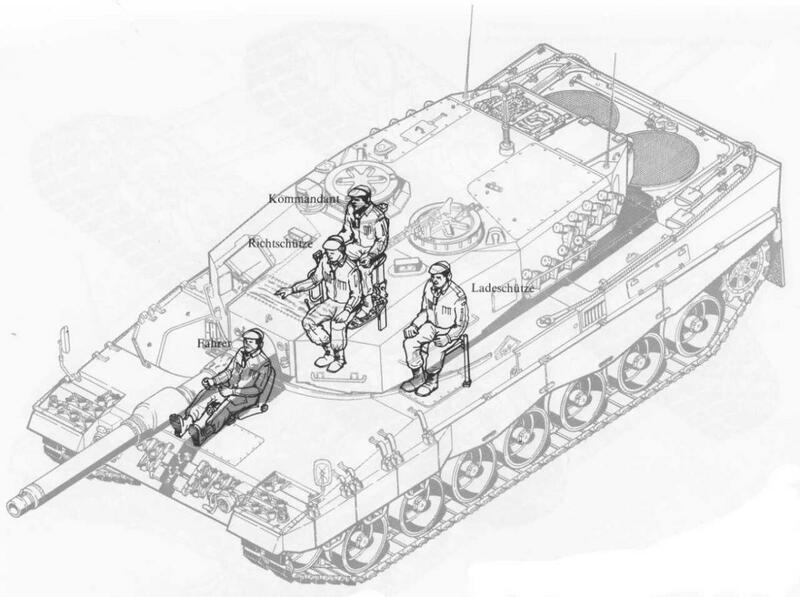 There are two main development batches of the tank: the original models, up to Leopard 2A4, which have vertically faced turret armour, and the improved models, namely the Leopard 2A5 and newer versions, which have angled arrow-shaped turret appliqué armour together with other improvements. - The baseline Leopard 2A0, sometimes informally called this way to differentiate it from later versions, was the first series manufactured version. The vehicles were manufactured from October 1979 until March 1982, altogether 380 vehicles. 209 were built by Krauss Maffei and 171 by MaK. The basic equipment consisted of electrical-hydraulic WNA-H22, a fire control computer, a laser rangefinder, a wind sensor, a general purpose telescope EMES 15, a panorama periscope PERI R17, the tower sight FERO Z18, on the tower roof as well as a computer controlled tank testing set RPP 1–8. 200 of the vehicles had a low-light enhancer (PZB 200) instead of a thermal imaging. Two chassis served as driver training vehicles. - The Leopard 2A1 featured minor modifications and the installation of the gunner's thermal sight. Deliveries of the 2A1 models started in March 1982 and ended in November 1983. The two most notable changes were the modification of the ammunition racks to be identical to those in the M1 Abrams, and redesigned fuel filters that reduced refuelling time. - The Leopard 2A2 was the designation given to upgraded vehicles of the first batch of Leopard 2s, brought up to the standard of the second and third batches. This modernisation gradually replaced the original PZB 200 sights in the first batch with thermal sights for the EMES 15 as they became available. Furthermore the upgrade included the fitting of filler openings and caps to the forward hull fuel tanks to allow separate refuelling, as well as the addition of a deflector plate for the periscope and a large coverplate to protect the existing NBC protection system. Finally, the tank was given new five metre towing cables with a different position. The programme began in 1984 and ended in 1987. - The Leopard 2A3 was the designation given to slightly modified vehicles of the fourth batch: 300 vehicles; 165 by Krauss-Maffei (Chassis Nr. 10624 to 10788) and 135 by Mak (Chassis Nr. 20510 to 20644), delivered between December 1984 and December 1985. The main change was the addition of the SEM80/90 digital radio sets (also being fitted to the Leopard 1 at the same time), and the ammunition reloading hatches being welded shut. - The Leopard 2A4 is the most widespread version of the Leopard 2 family; the Leopard 2A4 models included more substantial changes, including an automated fire and explosion suppression system, an all-digital fire control system able to handle new ammunition types, and improved turret with flat titanium/tungsten armour. The Leopard 2s were manufactured in eight batches between 1985 and 1992. All the older models were also upgraded to 2A4 standard. Until 1994 Germany operated a total of 2,125 2A4s (695 newly built and the rest modified older versions), while the Netherlands had an additional 445 tanks. 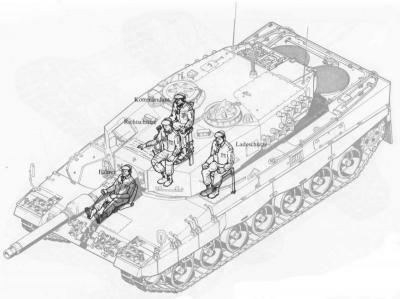 The 2A4 was also license manufactured in Switzerland as the Panzer 87 "Leopard" or Pz 87. This version included Swiss-built 7.5mm Mg 87 machine guns and communications equipment, and featured improved NBC protection system. Switzerland operated 380 Pz 87 tanks. After 2000, Germany and the Netherlands found themselves with large stocks of tanks they had no need for, because of the end Cold War. 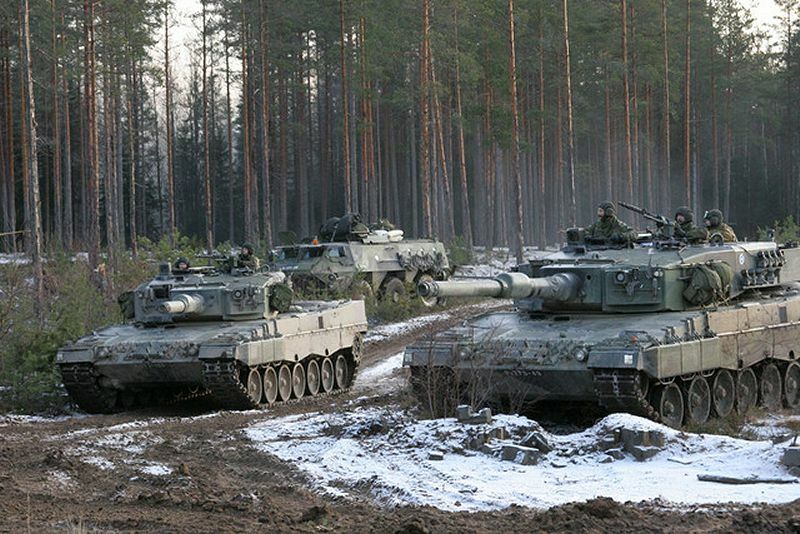 These tanks were sold to NATO or friendly armies around the world. Among these were Austria, which received 114 vehicles, Canada (107), Chile (140), Denmark (51), Finland (139), Greece (183), Norway (52), Poland (128), Portugal (37), Singapore (96), Spain (108), Sweden (160), and Turkey (354) were among the buyers of the surplus tanks. The tank featured in Tanktastic can be fully upgraded from the basic Leopard 2A0 to the latter Leopard 2A4; therefore, from now on, I will refer to it as it is once completely upgraded, i.e. Leopard 2A4. Since in Tanktastic the Leopard 2 groups, aside from the basic A0, its upgraded variants, the A1, the A2, the A3 and the A4, the tank features a very low price, though also a very high number of upgrades to buy, having a very low price of 6400 silver coins (this purchase option is unlocked once reaching rank 28, Second Lieutenant) or of 420 gold coins (this purchase option is unlocked once reaching rank 24, Chief Warrant Officer Grade 2). For the same reason this tank becomes one of the highest-tier unit in the game: the Leopard 2A4 has the highest level among all the tanks in the German line, featured in the NATO tech tree, following in its line the Marder 1A1, starting at level 39 and reaching level 67. The Leopard 2A4 features a two-tiers hull upgrade; both of them are required in order to acquire most of the other upgrades and don't change the tank's appearance; as of patch 1.22. Health pool upgrades: five-tier upgrade available. The Leopard 2A4 features a five-tier health upgrade. Because of the number of tiers, the tank's health pool is high, definitely above average. Passive armor upgrades: five-tier upgrade available. Spaced armor upgrades: two-tier upgrades available. The hull of the Leopard 2A4 has spaced multilayer armour and is divided into three compartments: driver at the front, located at the front right side, fighting in the centre and power pack at the rear. Some variants of the Leopard 2A4 are equipped with add-on armour to increase the protection of the crew against mines and improvised explosive devices. The turret, improved with flat titanium/tungsten armour, is mounted at the centre of the hull with the commander and gunner on the right and the loader on the left. The commander is provided with a circular hatch cover that opens to the rear and periscopes for all-round observation. The loader is seated on the left side of the turret and has a single-piece hatch cover that opens to the rear and a single day observation periscope. The Leopard 2A4 features a five-tier upgrade of passive armor and a two-tier upgrade of spaced armour, which is very effective, granting an excellent degree of protection against HEAT rounds; this allows the Leopard 2A4 to engage enemies in close range combats should the need arise, as, since the release of patch 1.21, HEAT rounds have become the main type of ammo used in higher tier battles. However, a major downside of this tank is the total absence of reactive armor, meaning this tank only relies on its passive armour when it comes to mitigate the damage dealt by enemies' main guns, which, even fully upgraded, isn't actually very effective; aside from the front turret armour, which is, on the other hand, fairly strong. Also, another downside of the Leopard 2A4 is the total absence of any kind of active protection system, making this tank vulnerable to ATGMs; however, since tanks can carry only a limited amount of ATGMs, unlike any other different type of ammo, they are subsequently rarely used, thus making this downside quite bearable. Besides, the tank can be fitted with smoke grenade dischargers, which provide protection from this threat. The Leopard 2A4 is armed with a 120mm smoothbore gun which has been developed by Rheinmetall, firing rounds that have a semi-combustible cartridge case with a metal base stub, ejected into a box under the breech. The Leopard 2A4 is fitted with a computerize fire control which has maximum range of 10000m with a measuring accuracy to within 20m at this range. The combined system allows the Leopard 2A4 to engage moving targets at ranges of up to 5000 meters whilst itself being on the move over rough terrain, with latest modern ammunitions. 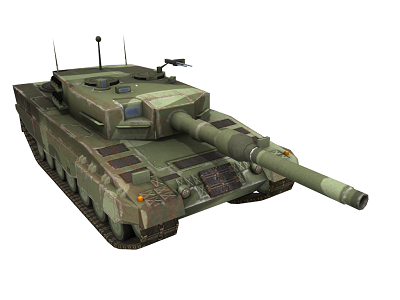 The Leopard 2A4 features a three-tier upgrade of the main gun, which grants a bonus to the damage and a bonus to the accuracy; while, however, also giving a malus to both speed and trasmission, starting from the second tier of the upgrade. The tank's damage is average. Anti Tank Guided Missile (ATGM): six-tier ammo upgrade available. Engine upgrades: three-tier upgrade available. The Leopard 2A4 is motorized with an MTU MB 873 diesel engine, which provides 1,103kW of engine output. The MTU MB 873 diesel engine is a four-stroke, 47.6 liter, 12-cylinder multi-fuel, exhaust turbo-charged, liquid-cooled engine. The Leopard 2A4 can run at a maximum road speed of 72km with a maximum cruising range of 550km. The Leopard 2A4 features a three-tier upgrade of the engine, which makes this tank very fast and fairly agile. The engine is located at the rear end of the tank and it's quite oversized, meaning that the Leopard 2A4 is prone to engine breakdowns and engine fires, especially if hit from the rear. The main gun is loaded manually; however, a three-tier upgrade of the reloading system allows this tank to achieve an above average reloading speed, which, combined with its average damage, grants the Leopard 2A4 a very high DPM. The Leopard 2A4 features a two-tier upgrade of the turret rotation system, achieving a high turret speed, being capable of performing a full rotation in less than 8 seconds. Unless having a very high momentum, this tank is very difficult to outflank, without it returning fire. Smoke grenade dischargers upgrades: four-tier upgrade available. -Very effective spaced armour upgrades, granting an excellent degree of protection against HEAT rounds. -Strong front turret armour, which, combined with a good gun depression, allows hull down engagements. -Thanks to the combination of an average damage and above average reloading speed, the Leopard 2A4 achieves one of the highest DPM among all the proper tanks in the game. -Very high turret rotation speed. -Total absence of reactive armor. -Passive armour, aside from the front turret, is not very effective. -Total absence of any kind of active protection system. -Engine is oversized, making this tank very prone to engine fires and engine breakdowns, especially when hit from the rear. The Leopard 2A4 is often referred to as a "glass cannon", and for a good reason: first of all, this tank doesn't feature any reactive armour upgrade, meaning that the damage dealt by enemy units is mitigated only by the tank's passive armour, which, however, isn't very effective. Therefore, despite the fact that the Leopard 2A4 features one the highest DPM among all the proper tanks in the game, this tank is absolutely not designed for head on engagements and for withstanding enemy fire: your amazing DPM is mitigated by the enemy's armour while theirs isn't, or, at least, not as effectively as yours is; resulting, in the end, in your defeat, most of the times, even against tanks featuring a low DPM, when it comes to head on engagements. However, the tank also features a high degree of protection against HEAT rounds, thanks to the presence of effective spaced armour, meaning that, since HEAT rounds have become the main type of ammo used in higher tier battles, the Leopard 2A4 can perform well in this kind of engagements. However, many experienced players knows that and are likely to quicky switch to AP rounds, ending up defeating you pretty easily. Therefore it's better not risking. Always stay away from the heat of the fight: the Leopard 2A4's amazing speed allows this tank to reach advanced strategic positions for putting flanking shots into enemy tanks, thus making the best use of its good DPM; most of the times, in fact, the tank you're shooting at will be dead before even realizing where you are and taking countermeasures. Once you have been spotted, put that speed to use and relocate, but remember that you can't do it quicky by reversing, as your reverse speed isn't great: the Leopard 2A4 doesn't performs well head on engagements, unless the enemy is shooting HEAT rounds, because of the low amount of armour and the lack of agility needed to effectively outflank most of the other tanks. This tank is also exceptional at sniping, expecially from strategic positions that allow you to engage enemies hull down: your turret armour is fairly strong, capable of withstanding a fair amount of enemy fire, while your DPM will simply obliterate advancing enemies. 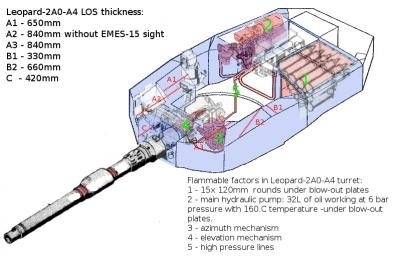 Another good tip is to buy and upgrade the smoke granade launchers system: as said above, the Leopard 2A4 lacks any kind of active protection system, and most enemies will realize that the fastest way to get rid of you shooting from a strategic position, is by using ATGMs. Therefore, as soon as you notice an enemy firing an ATGM at you, quickly activate the smoke granade launchers system to avoid being hit and, in the case, relocate or wait before getting back into position. The Leopard 2A4 might not seem an extremely tough opponent, but never underestimate it: first of all, never load HEAT rounds against this tank, it's almost useless: load AP rounds instead, as the tank's passive armour isn't very good, overall; when it comes to head on engagements, never shoot at the front of the turret, instead, shoot at the tracks, the least armoured part on the front section. Always take countermeasures to avoid being outflanked and unable to retun fire, when driving slower and less agile units, otherwise this tank's DPM will destroy you before you're able to take it down. The Leopard 2A4 is, however, also prone to being outflanked, as the reverse speed isn't great and the agility isn't exceptional. Therefore, when driving very fast and agile tanks you can try and successfully outmanoeuvre the Leopard 2A4, just be sure to have enough health to withstand some hits, as this tank features a high turret rotation speed and most likely it'll be able to return fire. When it comes to mid/long range engagements, the Leopard 2A4 becomes a hard nut to crack: relocate and find the safest route, meaning the one that grants you most protection and hide you from most of the shots, to get closer to the Leopard 2A4 and engage it in a close range combat. Never allow this tank to keep sniping you or to engage you hull down: its DPM and high health pool will get you dead in no time at all. Here I end my review of the amazing German Leopard 2A4, the ultimate flanker/sniper, beware of ambushes! Jerchel, Michael; Uwe Schnellbacher (1998). 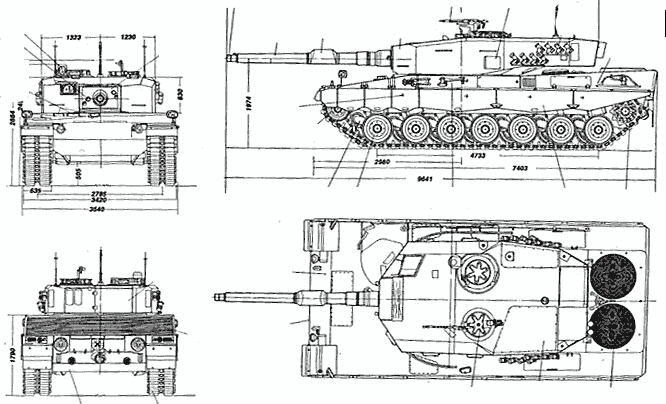 Leopard 2 Main Battle Tank 1979–1998. Oxford, United Kingdom: Osprey. 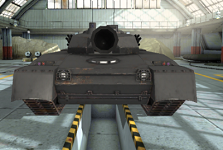 Fiutel_88 for allowing the Reviews Team to perform armor tests on his Leopard 2A4. So how do become an offical member? For now I play this tank seldomly. I'll be using as much as my BE when the 2A6) 7 modification arrives in 21a game patch. Why did Turkey get 3X more Leo2 then the rest? Simple. Turkey bought more Leopards than any other country. I got one after the 21a update, can't wait till modifications come out! 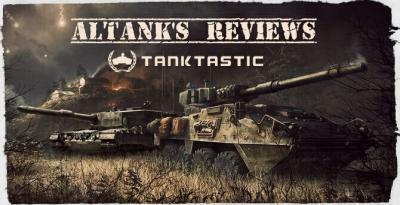 Following the release of patch 1.21, the Review has been updated, even though the performance of the tank hasn't changed that much, overall. Leopard 2A4 is is an outdated version with low armour. It's very vulnerable to AP and HE rounds. It dies in 2-3 shots by most high level tanks. It can get destroyed by just one K9's HE shell. Edited by JBDD, 23 April 2016 - 04:31 PM. Simple its match their envermantal requrment..
And it has terrible acceleration, agility and reverse speed make it very easy to flank.